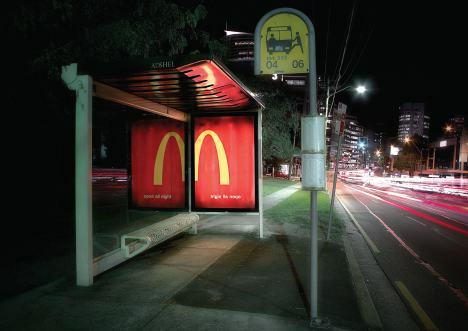 McDonald’s in Australia have an outdoor advertising campaign with a difference. Adshel roadside posters have been designed to promote the growing number of restaurants that are open all night. During the day, the reversed text and yellow curve are a curious sight. But after dark, the back-lit poster is reflected in the glass of the bus stop shelter, revealing the complete logo and the message, “Open all night”. The McDonalds Adshel Reflection ad was developed at DDB Sydney by executive creative director Matt Eastwood, copywriter Alex Stainton and art director Jakub Szymanski.